Converse are without a doubt one of the best brands in the whole wide world! They come in every colour under the sun and can be worn with just about anything. Super cool with a maxi dress or just jeans and a rock tee. I actually can't get enough of them. I am currently wearing to death the two shown above. I'm super lucky that I get away with wearing them to work. But what I am totally lusting after at the minute is studded cons. You can buy them online but it would be way cheaper and more fun to just order some studs off ebay and do the job yourself - which is exactly what I plan to do. soon. eventually. . . I wanna spike my converse!!! 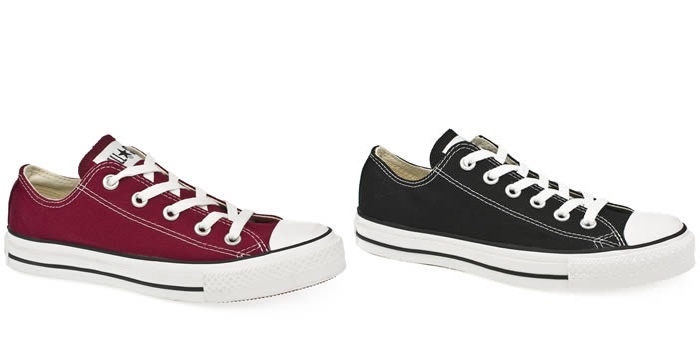 LOVE converse, although I only own two pairs, standard hi tops in white and burgundy!